StayAhead Training offer a comprehensive public schedule of courses across 7 training centres centres in the UK. 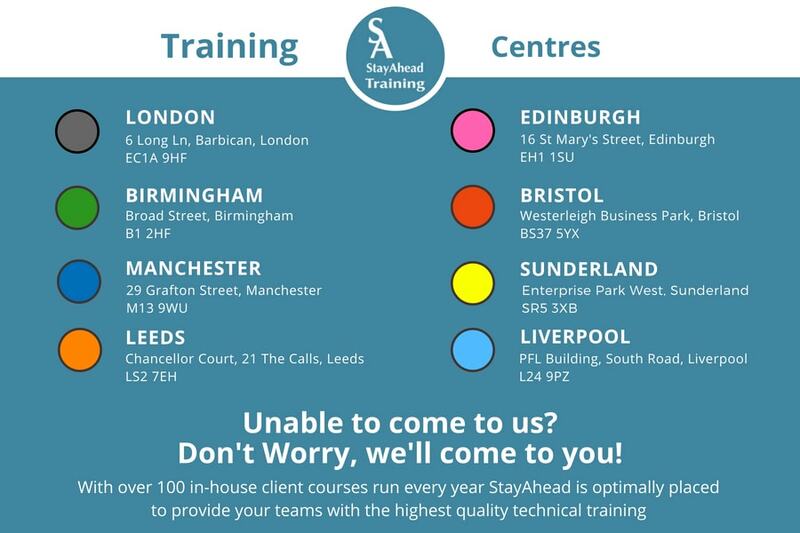 StayAhead Training scheduled courses are held at our fully equipped Training Centres in London, Bristol, Birmingham, Manchester, Leeds, Sunderland and Edinburgh. Our Instructor-Led courses can be attended in the Classroom or Virtually. Details of our scheduled courses can be accessed from the course schedule. If the course you require is not scheduled at your preferred centre, please contact us on 020 7600 6116 or sales@stayahead.com to enquire if we can accommodate your venue requirements.